Strategic planning is that corporate strategic planning is a systematic attempt to decide how best to anticipate and respond the challenge of change. 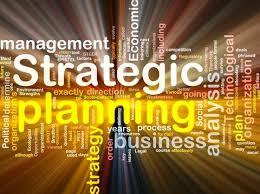 Strategic planning is an organizational management activity that is used to set priorities, focus energy and resources, strengthen operations, ensure that employees and other stakeholders are working toward common goals, establish agreement around intended outcomes/results, and assess and adjust the organization’s direction in response to a changing environment. It is a disciplined effort that produces fundamental decisions and actions that shape and guide what an organization is, who it serves, what it does, and why it does it, with a focus on the future. Effective strategic planning articulates not only where an organization is going and the actions needed to make progress, but also how it will know if it is successful. The process is strategic because it involves preparing the best way to respond to the circumstances of the organization’s environment, whether or not its circumstances are known in advance; nonprofits often must respond to dynamic and even hostile environments. Being strategic, then, means being clear about the organization’s objectives, being aware of the organization’s resources, and incorporating both into being consciously responsive to a dynamic environment. The process is about planning because it involves intentionally setting goals (i.e., choosing a desired future) and developing an approach to achieving those goals. The process is disciplined in that it calls for a certain order and pattern to keep it focused and productive. The process raises a sequence of questions that helps planners examine experience, test assumptions, gather and incorporate information about the present, and anticipate the environment in which the organization will be working in the future. The strategic planning can be complex, challenging, and even messy, but it is always defined by the basic ideas outlined above – and you can always return to these basics for insight into your own strategic planning process.